If you've been waiting for years for Twitter Analytics like many of us—your wait is now over! That's right, Twitter now has its own analytics reporting available to all for free (for now). Like most first releases, it's not as robust as other reporting tools out there but you can't complain about free data. 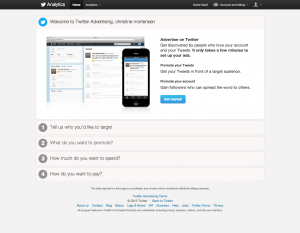 Since this is new, let's take a few minutes to kick the tires and look at how to use Twitter Analytics. Once you've created your account (or logged in) you'll notice a new navigation item in the upper left called "Analytics." From here you can access two different reports: Timeline activity and Followers. 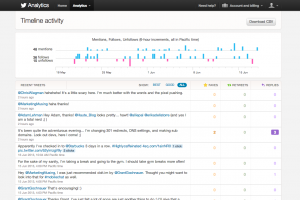 The timeline activity report will show you up to 500 of your past tweets. At the time of this writing, you can see the following engagement metrics: favorites, replies, retweets, and clicks. Unfortunately, one of the first things you may notice is that the columns to the right (favorites, replies, and retweets) are not sortable. You can, however, see which tweets drove the most engagement via the "show" options: "best" and "good". "Best" shows you the top 15% of tweets with some level of engagement. Again, this is not sortable by activity level, only chronological. This is something I suspect they'll add to the interface in the future. Right now though, you can export a CSV or Excel file which will let you sort. Surprisingly, clicks are not included here as an engagement metric. Click to enlarge the CVS export. The great thing about this screen is that you can get a good idea of what resonates with your audience so you can tailor your content accordingly. Next up is a little follower analysis. I just have to say that I LOVE this screen. Anything that will tell me more about my followers is a gold mine of insights. 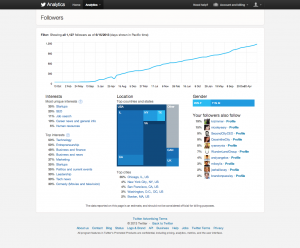 Two of my favorite insights here are the follower interests and who my followers also follow. For local small businesses, seeing your follower top locations will be key to ensure you're being heard by the right audiences. Sortable content within the interfase would be very nice. Right now, if you want to sort you have to export a CSV. This isn't a huge deal since you should be exporting your data on a regular basis anyways, but it does hinder what I call "drive-by-reporting" (i.e., quick check-ins to see what recent activity yields). Currently clicks are not emphasized in the UI. They are certainly there but not listed along side the other metrics. I have to wonder... is it because Twitter wants us to focus more on engagement metrics? —OR— Is click-through not included in the data export because they know brands will want to know this and will later charge for this knowledge? Mayhaps the answer is both! Although for now, my money is on engagement metrics. What do you think about these new analytics? Have questions or want to know more? Let us know in the comments below or contact us.